It has taken me so long to write about week 8, because week 8 was the week of some serious sleep deprivation!!!! We watched the favorite Mahabarata Tuesday night. If you haven’t learned by now, this is what Bikram likes for us to watch so we can understand why Indian culture is the way it is, and the origin of the different limbs of yoga. Sounds cool, but it is so boring! Bikram even jokes with us sometimes and says if we make him mad, he will make us watch Mahbarabata until the sun comes up! Then everyone starts groaning in agony. There was his one horse scene one time and it was the same shots played over and over with very annoying horse noise. Then there was another scene of a woman drowning her babies, one after the next. They were all the same baby, same shot, just put on repeat! Oh boy. So – we were up that night watching that. Then, Friday night we started Bollywood movie at midnight – yes MIDNIGHT!!! We don’t go to bed any earlier than midnight around here, and we were already sleep deprived from our late night Mahabarata night earlier in the week, and then we had this! Everyone was dragging in Saturday morning class with Rajashree to say the least. She asked us what was wrong with us, if our back hurt. I was thinking to myself ‘NO! your husband kept us up all week! !’ Someone told me at the beginning of training that sleep deprivation makes the yoga better because you don’t think you just do. We all know that the mind is a “bad neighborhood, and to get out of there” because a lot of the times what we can or cannot do isn’t determined by strength but by our mental capacity. Today was my favorite class with Emmy EVER, and tonight was my favorite class with Bikram EVER. Everyone even stood up after khaplabati breathing to give Emmy a standing ovation. last 2 classes of BYTT tomorrow!!!! 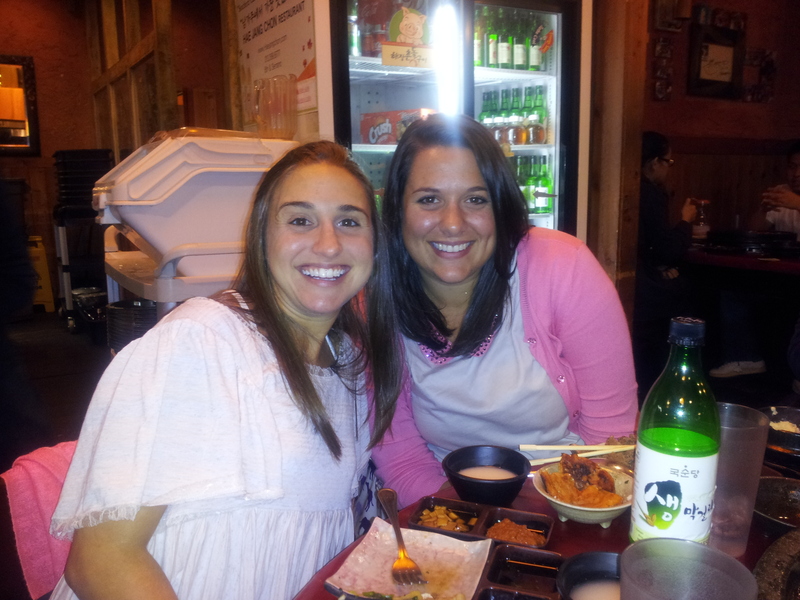 Hilary and I went for Korean BBQ this past weekend. It seems to be the theme of the weekend – EATING!